After 3 intense years of making thousands of pieces of jewelry for my business, ( I kid you not, just check my Flickr page ) I was feeling burned out on the whole notion of ‘wearable’ art. I love jewelry making, but I had been spending so much time thinking about chains, and findings and bracelet mandrels etc, that I began to loose sight of what originally drew me into polymer clay in the first place. I missed the mushy, squishy feeling that comes from holding a lump of fresh clay and letting your fingers guide you into the unknown. I wanted to reignite that ‘flow’ that comes from working on something that has no rules yet. So I took a step back to that simple and honest place where many artists begin and where children are always so brilliant. 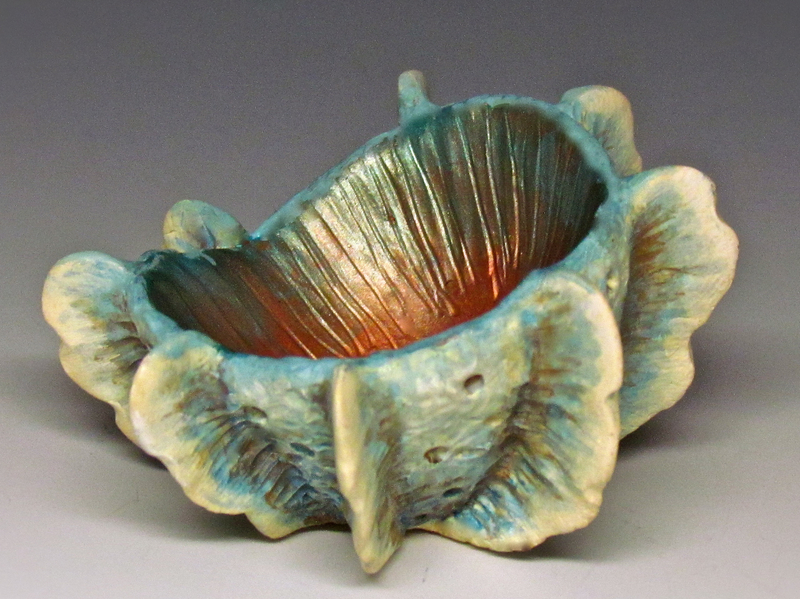 The pinch pot. My first attempts yielded a lot of pancakes with frilly edges. 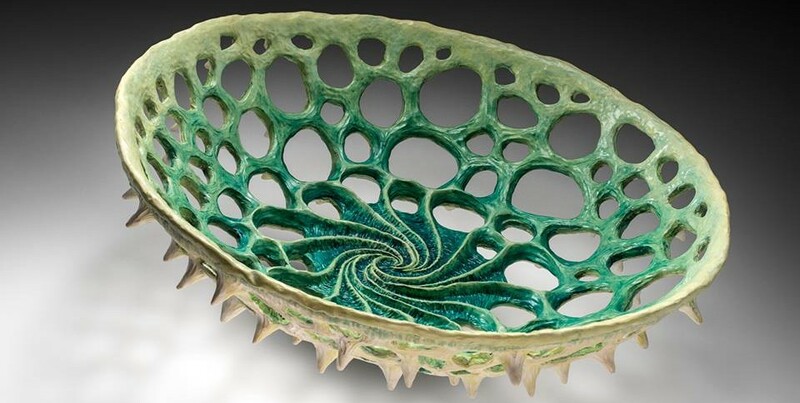 Pretty, but I wanted a vessel, not a jellyfish. I needed to find a way to build up before building out. I began to recall skills I employed 4 decades earlier as a potter throwing on the wheel. An odd combination of pushing in and steadying from the outside, while pulling up from the inside. 40 years! Talk about stepping backwards! 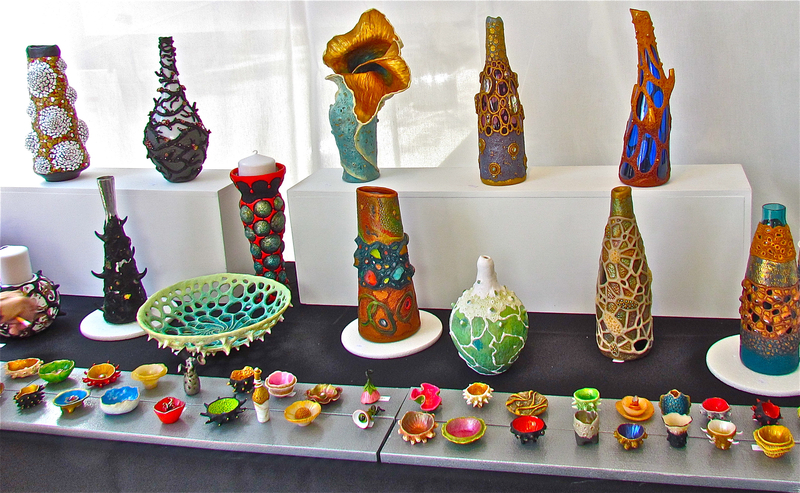 I wondered if could I apply a similar line of thought to create my mini vessels. My hands became a sort of a defacto potters wheel. Holding the ball of clay in my left hand and twisting it towards me while using a fondant ball tool in my right hand to push the clay up and away from me. The ball tool is like an extra thumb with no fingerprints. By working the clay around and around like this, I was able to thin and raise the walls to a towering 1 and 1/2 inches tall. 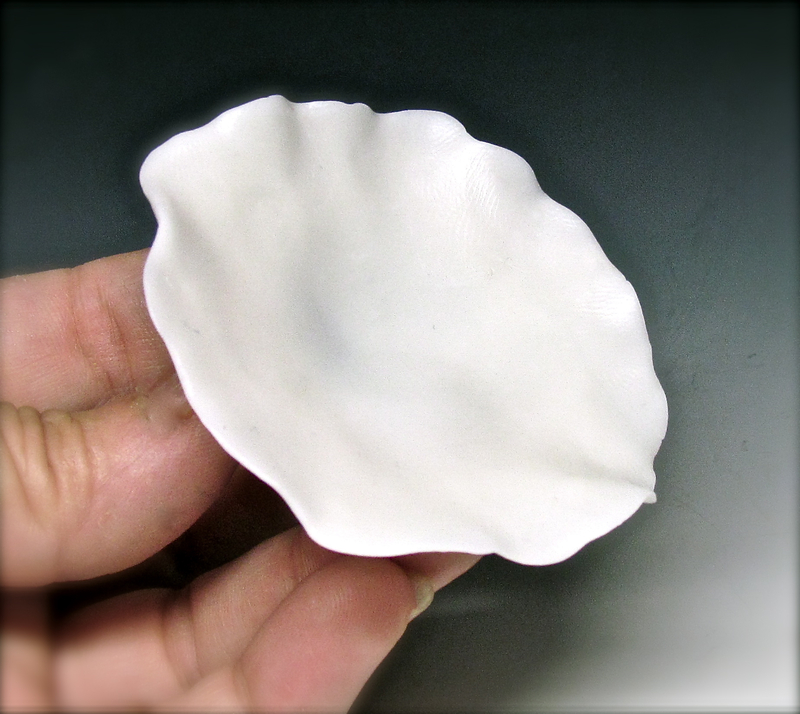 Then carefully, while still turning the clay, I pulled open the center with the tips of my fingers to widen the shape. A rudimentary vessel was coming to life. And what about pinch part? Using methods somewhat similar to cane reduction, I could pinch a tall piece to go even taller and create a bottle neck. Or pinch the sidewalls together to give my pot wings. I could completely change a form with a well placed squeeze. Once I got the hang of it, I was able to move quite quickly between various shapes with one piece informing the next. Here was the good, yummy stuff I had been hungry for. And once these basic shapes were cured, I had a world of choices on how to finish them. The options are endless. * A gift for my readers. And, a final gift for my readers before we part today. Somewhere in the dark recesses of my brain, I remembered the first book I bought myself when learning ceramics. FINDING ONE’S WAY WITH CLAY Pinched Pottery and the Color of Clay, by Paulus Berensohn. I still have it! This well loved, well read, dog eared book was my touchstone. Berensohn’s respect for the simple gesture of making a pinch pot is still speaking to me across the decades. Long out of print, you can find old copies on Amazon. I recommend it for all artists working with any kind of clay. 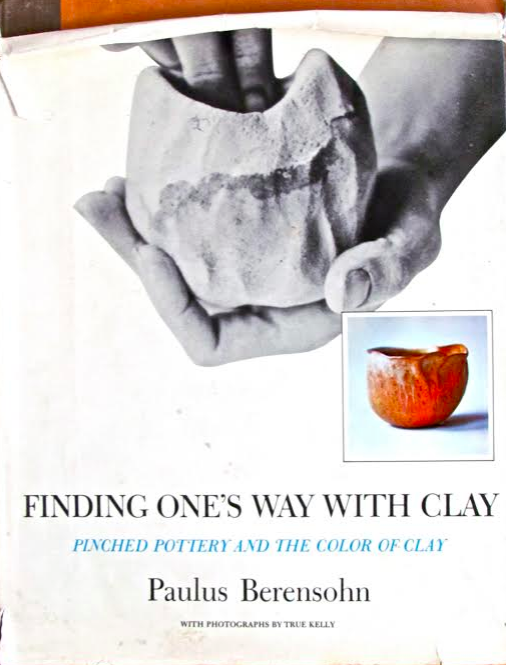 FINDING ONE’S WAY WITH CLAY Pinched Pottery and the Color of Clay, by Paulus Berensohn.